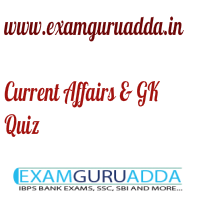 Dear Readers Examguruadda.in presents Current Affairs quiz of 23-24 November 2016 that cover important current affair events. Current Affairs quiz prepared according to the latest Bank, SSC and other competitive exam. 1. Who has been elected as the new President of Federation of Indian Chambers of Commerce and Industry (FICCI) for 2017? 2. William Trevor, who died recently, was the renowned author of which country? 3. Who has launched India’s first payment bank? 4. Who was appointed as the CEO of State Bank of Mauritius (SBM) Group? 5. Who will be the chief guest at the 14th Pravasi Bharatiya Divas (PBD) Convention? 6. Who has been appointed as the new Chairman of National Highways Authority of India (NHAI)? 7. Who has become the India’s first e-assembly constituency? 8. The 2016 World Robot Olympiad (WRO) will be held in which country? 9. India’s first International Children’s festival will be held in which city? 10. Which committee was constituted by Union Government on Yoga Education in Universities?